Offering our guests a clean, friendly, quiet, home-like environment for your visit to Vermont. The Innkeepers Kami, Kevin, and Emily Golembeski with their Labrador Retreiver welcome every guest with open arms. Guests awaken to the scenic mountain views while dining on a warm hardy Vermont breakfast with daily specials such as Quiche, Stuffed French Toast, homemade sweet breads, as well as eggs, cereals, and more. The Labrador Lounge , lovingly named after the innkeepers Labradors, boasts 8 Vermont beers on draft, a red and white wine selection, comfortable couches, multiple TV’s including a big screen TV, pool table, video games, board games, great views, and a sit around fireplace. BREAKFAST SERVED DAILY FROM 7:30 until 9:00AM. 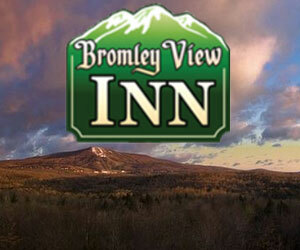 A highly recommended Vermont Inn. Ask us about Bromley Stratton or Mt. Snow area lodging. If you would like to add your Southern Vermont Country Inn, Lodge or Bed Breakfast Inn to this web site, please contact us.